Pigments are so versatile. you can use them as eye shadow, blush, mixed in with a clear gloss to create a unique lip colour and even mixed in with your lotion to give you a glow. 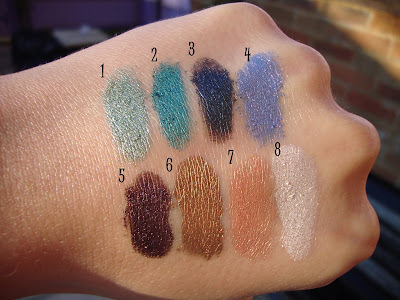 I think that Mac do great pigments, they are great quality and have a great choice of colours. Below are the ones I have. My favourite out of the pigments has to be 'Melon' pigment, it's such a great colour for any skin tone. I also like 'Deep purple' pigment to create a smokey eye, it just looks gorgeous, so much better than using 'carbon' e/s if you don't want your look to be harsh. 'Vanilla' is a classic, it makes a great highlight on the cheekbones and inner corners of the eye. Barry M also do pigments, and they call them 'dazzle dusts priced at £4.50 each. They are highly pigmented, great quality and have an amazing colour choice. They also do fine glitter dusts which have finely milled glitter in them. All dazzle dusts come with a sheen, they are not matte. Below are the ones I have. My favourite dazzle dust is No 79 'Gold green' this just looks amazing on me, I team it with UD 'Mayhem' similar to Barry M's 'Pearly mauve' in the crease. I love the effect it gives. My favourite fine glitter dust is No 22 'Black gold' this is a black with very finely milled gold glitter in it. It just looks beautiful. TIP: When using pigments never ever use a fluffy shader brush, make sure it's flat and made of synthetic bristles like Mac's 242. Pack the colour onto your eyelid after using a base. You could also try adding Fix+ to create a paste. Thanks so much for the tip... now I know where I've been going wrong! Thank you! thanks for the swatches they all look lovely! Melon mixed with a clear lipgloss will get gorgeous!!! I also like Barry M. 24 and 25 really pretty :) Great swatches ! I don't have any MAc pigments, but I love, love, love Dazzle Dusts. My favourites at the moment are #93 Block Blue, #83 Green Silver, #78 Kingfisher and #44 Bronze. Great tip on the brushes too, thank you. I tend to apply the dazzle dusts wet or using a foam/sponge applicator because I get much less fallout that way. The colours are amazing, great selection there. Melon is pretty but that one you sugest to replace carbon is very special too. Woah u have a of of dazzle dusts! I love cornflower pigment..Ive got a sample but I want the full size. Is it permanent or ltd edition? I wish we had Barry M in the states. I love all the colors. I love the melon, the teal, and every thing in the last set of swatches! @Imo I think its permanent. I love Mac's pigments they are such amazing quality for money & i've never paid full price (ebay) for one expect for my beloved sunnydaze which is my staple!